As the first phase for the renovation, a complete set of new LED lighting was supplied for the existing power rails. This immediately made for a huge improvement. With its old lighting fixtures, the shop was not adequately lit when seen from street view. The result was immediately overwhelming to the customers. 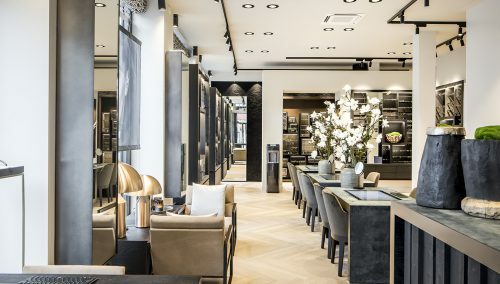 Half a year later, in February 2017, the second phase was realised with a fully renovated shop interior. Based on excellent collaboration with a local electrician and a smart wall system, the full assembly took just 3 days. 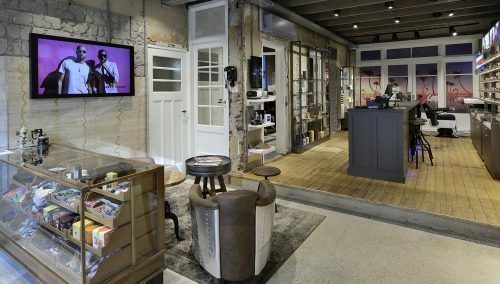 The challenge in this optician store in Bergisch Gladbach was mostly a smart lay-out for the long, narrow shop surface. The space was clearly split in two by adding two advice and sales tables on the left wall, followed by the service counter and the refraction space. This freed up the entire right wall for a long presentation of frames, with stock drawers over the full length. After entering, the first striking feature is the warm, sound-absorbing walls near the sales tables. A high-quality checked and stitched soft furniture-grade cloth was used, adorned with an adjustable decorative wall lamp. This lay-out created clarity and calm near the advice tables. The new lay-out gives a great overview of the full collection, which is a striking and varied display. 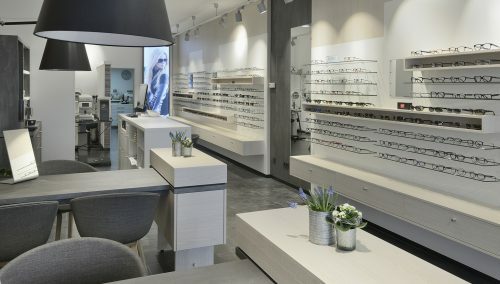 WSB Interior Construction is responsible for the complete store concept of opticians: Retail Design, Instore communication, External wall modifications, Request for Proposals, Finishing, Floors, Ceilings, Lighting design and Interior Construction works. WSB own cabinet makers deliver work at the highest level! Do you want to know more? Call WSB for an inspiring and non-binding brainstorm session! Or check out this page: www.wsbinterieurbouw.nl/optiek/for the most relevant information for opticians!